A research assistant at a Turkish university allegedly killed four of his colleagues Thursday in a shooting spree reportedly preceded by over one hundred accusations of ties to anti-government Islamic cleric Fethullah Gulen. Gulen, once an ally of President Recep Tayyip Erdogan, has become one of his loudest critics and lives in self-imposed exile on Pennsylvania. The Erdogan government has arrested, fired, or interrogated over 100,000 people since 2016 for ties to Gulen’s group, which Ankara refers to as the Fethullah Terrorist Organization (FETO). Of particular concern to the Turkish government is Gulen’s alleged infiltration of the country’s higher education system. Turkish media report that the man arrested for the shooting, identified as Volkan Bayar, is being investigated for ties to Gulen himself despite being responsible for implicating over one hundred people in Gulen investigations. Bayar and his ex-wife were arrested shortly following the shooting. The Turkish outlet MilliGazete reports that the couple had been separated for three years and officially divorced a year ago. Authorities have not provided more information for why the unidentified woman is in police custody, as well. Yeni Safak, a pro-Erdogan Turkish newspaper, lays out evidence that Bayar was a member of Gulen’s group. “There were personnel who lodged a complaint claiming that he [Bayar] was a FETÖ member. He lodged a complaint to counter this, saying that he was not. Thus, we were investigating the matter,” said university rector Prof. Dr. Hasan Gönen. The newspaper also notes that Bayar concluded graduate studies in the United States, where Gulen lives. 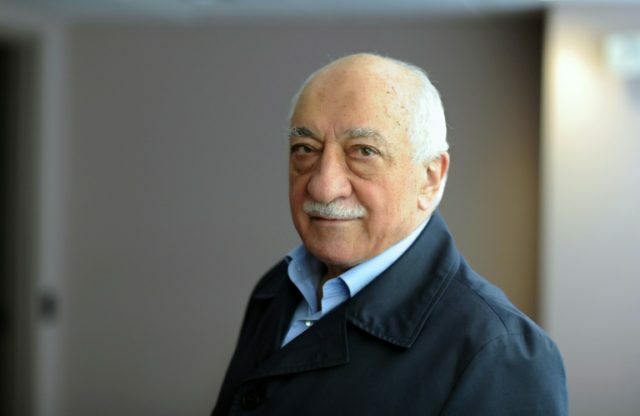 The newspaper has previously accused Gulen himself of being a CIA operative and the United States of using Gulen and the Islamic State to attempt to destabilize the Erdogan government. A former deputy dean of the school’s education faculty told Hurriyet that several officials warned their superiors and law enforcement that Bayar “was threatening people with murder,” but that neither the police nor university officials appeared to act to remove him from the university or take away his access to firearms. A former professor who spoke to Hurriyet also accused Bayar of being a member of Gulen’s group—which Gulen calls “Hizmet,” rather than the government’s FETO label. The professor, Yalçın Bay, noted that he was fired from the school after Bayar accused him of being a Gulenist along with 102 other people. In Bay’s case, an attempt to accuse him of spreading false allegations resulted in prosecutors lauding him for “performing his civic duty,” according to Bay. Police have yet to divulge how the suspect acquired a firearm in order to enact the mass murder, or what kind of weapon he used. Turks must be over the age of 21 to obtain a gun license and must present to the government a valid reason for obtaining a firearm before receiving a gun license. Hunting and self-defense are considered legal reason to own a gun. Fethullah Gulen faces 3,600 life sentences if he ever returns to Turkey, most for his alleged involvement in the failed coup against Erdogan in July 2016. Turkey has repeatedly demanded that Washington extradite Gulen, but both the Obama and Trump administrations have insisted that Ankara has not provided sufficient evidence tying Gulen to any crimes. Gulen himself denies any involvement in criminal activity. Most recently, Erdogan proposed trading Gulen for the wrongfully imprisoned American Christian pastor Andrew Brunson, behind bars in Turkey on charges of being a Gulenist despite not being Muslim.